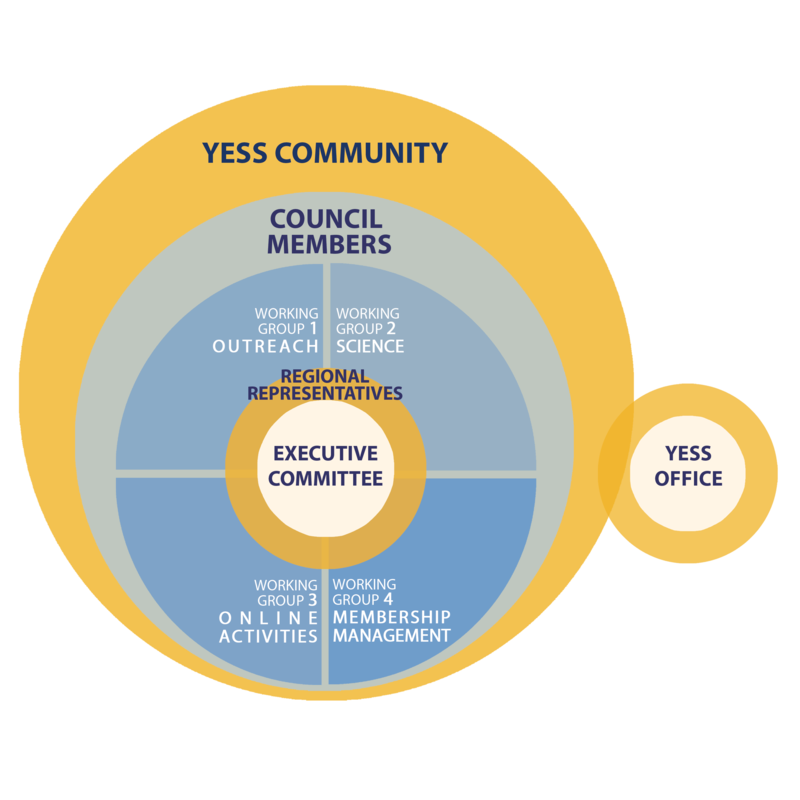 The organization of YESS community activities is decentralized in small groups. YESS does not have central funding or a strict hierarchical structure and strongly relies on voluntary work of enthusiastic early career researchers. YESS is a fast growing international global early career network in the Earth system sciences and has more than 1000 members from over 100 countries. YESS collaborates with and is thankful to receive support from several partners. The Council is open to all active YESS members interested in shaping the development and activities of the community. The Council members elect the Regional Representatives and the Executive Committee members. The activities of the Council members are mainly organized within the working groups. Regional representatives are elected yearly by the Council members. These regions are Africa, Central Asia, Europe, North America, South America, South East Asia and South West Pacific. Regional Representatives support the Executive Committee by sharing experience, special interests, situations, or information from their region. They are also responsible for the growth of YESS in their region and serve as the contact point for specific regional questions or tasks. 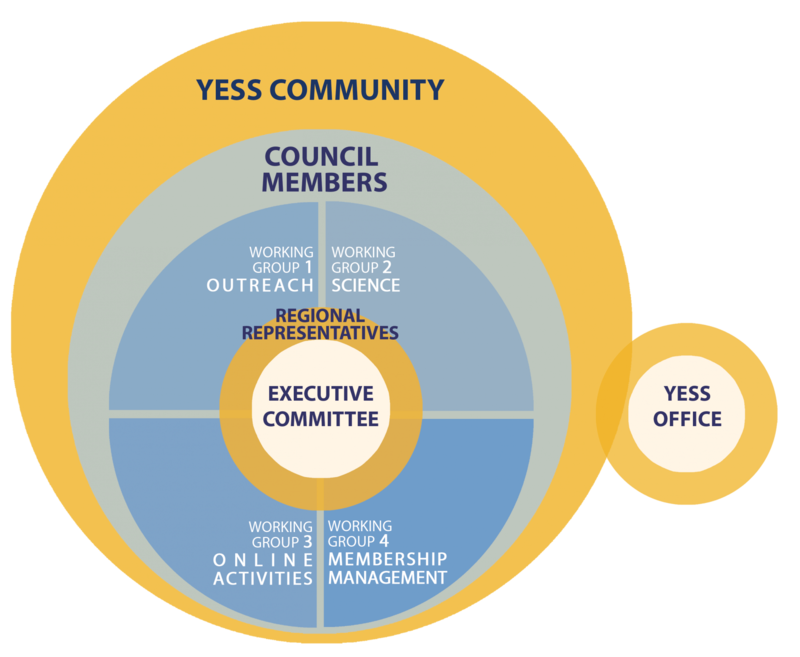 The activities of the YESS community are developed through the Working Groups. The Working Groups ensure that the network keeps vital and maintained. Currently we have working groups on: Online-events; Membership/Website; Outreach and Science. The Working Groups are open for every YESS member and we welcome YESS members to join any time! The Executive Committee is elected each year by the Council. It consists of up to six members and is responsible for maintaining an overview and guiding YESS activities. The Executive Committee also serves as the contact point for communication both within the YESS community and with external partners. The structure of the YESS community has been formalised in the YESS Terms of Reference.